Plot Summary: Noriko Takichi is just an ordinary high school student. One day on her way home from school with her friends, she was hit by bomb blast and she was thrown into another world. In there, when she's nearly being attacked by monster, Izaku suddenly appear and help her. It turns out that Noriko is "The Light" which all the kingdoms in this world have been looking for, and also the one that Izaku trying to kill so Izaku can change his fate for not becoming "The Darkness" that every fortune tellers told him since his childhood. Noriko believes that she been thrown to this world because there is a purpose, so she try to do her very best. 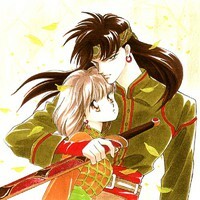 Izaku didn't want to kill Noriko because he starts to like her. The romance starts to grow between them. When Noriko find out that Izaku is "The Darkness" who tries to kill her when they first met, they vow to find a way to change their destiny and be together forever. The battle between Good and Evil and battle within Izaku himself start from now.